Olives have a long history in the Mediterranean, but were not widely cultivated in California until the 20th century, when an industry formed around the development of reliable canning and pitting systems to produce the mild-mannered canned black olive. Today, that appears to be changing, as a wide array of olive varieties are now grown commercially in California, including Manzanillo, Mission, Sevillano, Ascolano and Barouni, among others. While the majority of these get pressed and made into olive oil, others can be bought cured, and a small percentage can also be found whole, for those interested in curing them at home. 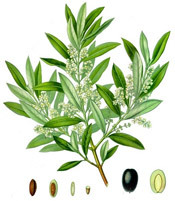 Olives can be harvested in early fall when the fruit are green-ripe and contain more oleuropein, the bitter compound that makes them inedible raw. When left to further ripen on the tree into November and December, the bitterness decreases, the olives turn darker — anywhere from red to blue-black, depending on the variety — and their flavor mellows. Oleuropein isn’t toxic, but even a nibble of an untreated olive will leave an astringent taste lingering in your mouth for hours. They key to “curing,” or making these ancient fruit edible, is to rid them of their bitterness while preserving their other flavors. Several methods can be used. Water curing changes the natural flavor the least, requiring only several days of soaking, draining and refilling. 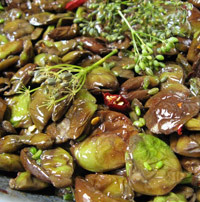 In brine curing, natural fermentation in a salt solution over several months gives the olives a unique flavor. Dry salt curing, also known as oil curing, requires packing the olives in salt to draw out both water and oleuropein and works well with smaller olive varieties. Lye curing, or soaking the olives in an alkali solution followed by several fresh water baths, is the fastest method and results in mild, buttery olives. But working with lye can be hazardous, so it is rarely recommended for beginners. Every fall, Carmen Gagliardi and his wife Kathleen — parents of Marcia “the tablehopper” Gagliardi — cure their own olives. In the Calabria region of southern Italy, where Carmen is from, fall is the time for pressing wine, hunting mushrooms, making prosciutto and preparing the olives that will be eaten for the rest of the year. I visited Carmen recently at his home on the Peninsula to watch him make his water-cured Calabrese-style cracked green olives. It took a little time and effort, but it was well worth the flavor, which, Carmen says, you won’t find in any commercially made olives at the supermarket. The recipe (see below) requires you to remove nearly all the moisture in the olives after the curing process so they can be preserved, confit-style, in olive oil. 1) Choose freshly picked, medium-sized, uniformly green olives that are similar in size so they cure at the same rate. 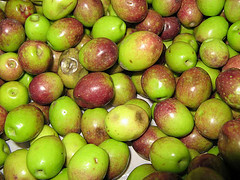 Olives that have begun to show a purple blush can still be water-cured, but you should eat or give them away first as they will not keep as long as the true green ones. Discard any bruised olives; they will get too soft when cured. 2) Lay a clean kitchen towel or rag on top of a cutting board or other sturdy surface and place a bucket of fresh, cool water nearby. Using a light rubber mallet, crack each olive and discard the pit. Place the cracked olive meat into the bucket. You will see the water turn cloudy with oil and oleuropein. 3) Rinse the cracked olives in a colander, then drain. Place them in a non-reactive container and cover with water. Cover with a heavy plate, or anything that keeps them submerged. Change the water daily. 4) After 5 or 6 days, start tasting the olives. They should be ready in about 10 days, give or take, depending on the size of the olives and your flavor preferences. 5) When the olives have mellowed to your liking, drain them well and transfer to a press of some kind. 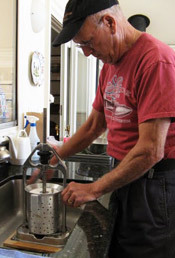 (Carmen made his own olive press by making holes in a pitcher and placing it under the press from a sausage stuffing machine. But a potato ricer or citrus press could work for pressing the olives in batches.) Then slowly press all the water out of the olives, allowing plenty of time for the water to drain before gently adding more pressure. This step is crucial because leftover water will cause the olives to soften. 7) Place the olives in glass jars that have been sterilized as for preserves (Carmen uses his espresso maker), and pour in additional olive oil to cover the olives completely. Cap tightly and keep refrigerated.